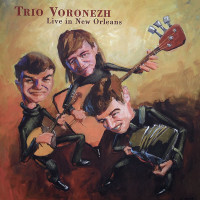 Trio Voronezh: Live in New Orleans. Works by various composers. Trio Voronezh: Valerie Petrukhin (double-bass balalaika), Vladimir Volokhin (domra), Sergei Teleshev (bajan). Distributed by the Trio Voronezh: http://www.triovoronezh.com/. The Trio Voronezh can play anything, as this live performance recording from New Orleans will confirm. The three classically trained musicians from the Academy of Music in Voronezh, Russia, came together in 1933, and started to play on streets and in subways, eventually moving to concert stages. Their first US appearance was in 1996 at the Oregon Bach Festival. Valerie Petrukhin plays a double-bass balalaika, a huge three-stringed instrument with a distinctive triangular body and long neck; Vladimir Volokhin plays a domra, a smaller three-stringed instrument akin to a mandolin, and Sergei Teleshev plays the bajan, a kind of chromatic accordion. The ensemble’s colors are delightful. The domra is clearly a treble instrument and the double-bass balalaika provides a very solid bass, but the bajan, the only instrument here capable of sustaining chords, contributes both melody and accompaniment. This inviting two-CD set presents 20 varied arrangements from Bach to contemporary Russian folksongs. Most of the works are short and perky, tuneful dance tunes or other fast-moving pieces. Where else could Piazzolla’s Michelangelo ‘70 follow Rachmaninoff’s Vocalise? Of course Piazzolla sounds totally natural here, as does the Polka from Shostakovich’s The Age of Gold and Schnittke’s Gogol Suite. The Trio gives their version of an entire Vivaldi / Bach concerto with great flair (a concerto that Bach had arranged for organ from one of Vivaldi’s for strings), and there’s a bit of that obligatory potboiler by Mozart, Eine Kleine Nachtsmusik. Virtuosic works, like the Finale of Sarasate’s Carmen Suite, bring out the ensemble’s gracefulness and precision, and Leroy Anderson’s Fiddle Faddle is so completely absurd and endearing when they play it. Audience acclaim indicates that these guys love to perform. Somebody had better write them a concerto, or put them on a soundtrack. Rarely do you come across anything so jubilant and such fun. Listen in the morning and you’ll be in a good mood the whole day. Deep Night, Deep Autumn. 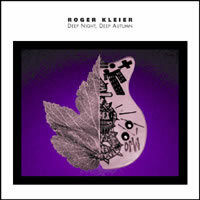 Roger KLEIER: We Speak of Deep Night (1998); The Juan Cortina Suite (1998); Brickyard (1998); Lodi (1996); Chambers Street (1998); Woodside Meteor (1998); We Speak of Deep Autumn (1998). Roger Kleier (guitars, electronics), Annie Gosfield (keyboards). Starkland ST-211 (http://www.starkland.com/). Roger Kleier knows his way around the guitar, and certainly around the electronic music studio. Kleier’s starting point for this disc is definitely an instrument with strings, but with Annie Gosfield on keyboards (mostly synthesizers) and much post-processing, the final product is tough to characterize as guitar. Woodside Meteor, the eighth track on the disc, most elegantly represents what Kleier can do. A straightforward layer of looped guitar sounds in 5 / 4 time — sounding almost African in rhythm and mode — is banished under some fleeting distortions of itself alternately mimicking the tweety sound of 1950’s computer music and the rubbing of a balloon. There’s also gentle solo-line that sounds Hawaiian. This description doesn’t do Kleier justice, except to indicate a lively palette, varied influences, and a good set of ears. 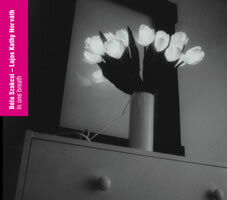 Other tracks unfold like grand pageants, such as We Speak of Deep Night, which connects several disparate styles of guitar playing, processed electronic textures, and backgrounds. The three-movement Juan Cortina Suite is a bracing look at a charged moment of Mexican-American history and it too blends a variety of moods and colors. I played the tiny one-minute track, Brickyard, several times immediately on first hearing to savor its enveloping spectrum of modulated and slowed-down guitar sounds. Something about it reminded me of the oddest of David Lynch’s movies. It may just be a simple guitar riff that’s been brought to its knees and ring-modulated, but it’s quite a neat minute. Starkland has a small but high-quality catalog. I recommend ST-206 with music by Charles Amirkhanian who does things with words and texts that no one else does, and also ST-202 with classic electronic music by Tod Dockstader. Kleier’s new disc is in good company. In One Breath. Lajos Kathy Horváth (violin), Béla Szakcsi (piano). Budapest Music Center Records BMC CD 061 (http://www.bmcrecords.hu/). Distributed in the US by Qualiton (http://www.qualiton.com/). A pianist and violinist come together to create four improvisations. Lajos Kathy Horváth, violin, and Béla Szakcsi, piano, spent no more than a few sentences describing what each improvisation would be like, and the tracks on this disc were put down “In One Breath.” Each improvisation is dedicated to a composer whose music they know well: György Kurtág, Peter Eötvös, Pierre Boulez and György Ligeti (those who have heard of Szakcsi before this will be surprised to learn his current musical interests!). As is his trademark, Horváth uses multiple mistuned stringed instruments during the course of this disc: four mistuned violins, one mistuned viola, and one properly tuned violin. Szakcsi seems content with just a single piano and keeps to its keyboard end. Supplication for everyone is for Kurtág. It opens slowly and gently but builds to a climax. Clocking in at 13:06, it’s longer and has more notes than most of Kurtág’s music, but the precise attention to details is in keeping with its dedicatee. The piece for Ligeti, Playing with piano and violins, echoes the complex rhythms and scale passages favored by Ligeti in such works as the piano etudes. This is the most intricate of these four works, and the use of mistuned violins is most audible and fitting here. 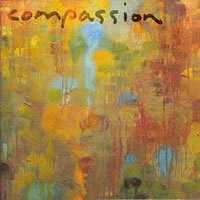 Compassion. Works by John TAVENER, Shulamit RAN, Chen YI, Hans Werner HENZE, Yinam LEEF, Poul RUDERS, Somei SATOH, Wolfgang RIHM, Iannis XENAKIS, Lukas FOSS, Karel HUSA, Betty OLIVERO, György KURTÁG, Philip GLASS, Steve REICH. Edna Michell (violin), Igor Ardasev (violin), Ulf Hoelscher (violin), Nachum Erlich (violin), Bohuslav Matousek (violin), Shlomo Mintz (violin), Michal Kanka (cello), Ludmilla Peterková (clarinet), Susan Narucki (soprano), Patricia Rozario (soprano), Allen Ginsburg (narrator), Czech Philharmonic Chamber Orchestra, Lukas Foss (cond. ), Karlsruhe Ensemble, Andreas Weiss (cond.). Angel 7243 5 57179 2 4 (http://www.angelrecords.com/). This is an odd CD that might be hard to find now, even though it was released in 2001. My copy was plucked from a discount bin at a favorite used-CD store. The concept behind this disc is admirable: Yehudi Menuhin and Edna Michell asked several composers to “write pieces inspired by the theme of universal compassion.” After Menuhin’s death in 1999, Michell completed the project and it became a sort of memorial to Menuhin. This is an eclectic collection of 15 pieces ranging from solos, duos and trios to works for string orchestra with solo violins, soprano or speaker. Everyone will find at least one work to like. Tavener’s mellow Song of the Angel for violin, soprano and string orchestra has an opening “Hallelujah” that sounds like the familiar Cantilena of Villa-Lobos’ Bachiana brasiliera No. 8 except that the voice and violin can’t seem to match unison phrases. Glass’s Echorus adds Allen Ginsberg reciting excerpts from his Wales Visitation atop the arpeggiated chords of two violins and string orchestra. Ginsberg’s voice is mesmerizing even though his poetry is somewhat nonsensical should you follow along. At the other extreme is Xenakis’ Hunem Iduhey, a terse and caustic duo for violin and cello playing without vibrato. It’s the shortest piece here (only 3:01), and that probably pleases most people, but it’s the reason I sought out this disc. Kurtág’s Ligatura is also remote; its two violins intersect with dissonance and occasional glimmering lightness. The omnipresent Rihm has a solo violin Cantilena here which meanders melancholically across the range of the instrument. Henze’s Adagio Adagio is an unexpectedly romantic piano trio, sounding like a page cast off from a French work of the early 20th century. I would never have guessed that Henze had written it. Satoh’s Innocence for violin, soprano and six cellos is the most exotic: The cellos reproduce the sound of a sho, a Japanese mouth organ made from bamboo. All the works are sensitively played, and Michell appears in all except the Tavener, Yi’s Romance of Hsiao and Ch’in for two violins and string orchestra, and Ruder’s Credo for two violins, clarinet and string orchestra. Michell has been playing contemporary music for some time; for example, she plays Feldman on Editions RZ (RZ 1010). It will be interesting to see which works end up in concerts and on other recordings. I recommend snagging this compilation if you can find it. Ildikó Vékony: Splinters. György KURTÁG: Splinters, Op. 6/c; Eight duets for violin and cimbalom, Op. 4; Hommage à Ferenc Berényi 70; Un brin de bruyère à Witold — in memoriam Witold Lutoslawski. László VIDOVSKY: For one or two cimbaloms. Adám KONDOR: Hungarian folk song forms — Eight other duets for viola and cimbalom. László SÁRY: Slow and Brisk. Zsolt SEREI: the (version A). Zoltán JENEY: Shavings. Ildikó Vékony (cimbalom), András Keller (violin), Ferenc Varga (viola). Budapest Music Center Records BMC CD 046 (http://www.bmcrecords.hu/). Distributed in the US by Qualiton (http://www.qualiton.com/). Also available at Arkivmusic. In 1890 the cimbalom was declared the national musical instrument of Hungary. In 1897 it appeared on the curriculum at the Budapest Academy of Music. Similar to a dulcimer, the cimbalom has 125 strings and a range approaching five octaves. It’s laid out somewhat like a piano or harp, except that it is played with wooden (sometimes metal) mallets. It sounds much like a banjo with an ephemeral, delicate and somewhat tinny sound and is best suited to intimate chamber music, although it is often amplified when part of an orchestra. The cimbalom has been used by many non-Hungarian composers, such as Stravinsky (Ragtime), Dutilleux (Violin Concerto “L’Arbre des Songes”), and Boulez (Éclat, Éclat / Multiples, Répons). 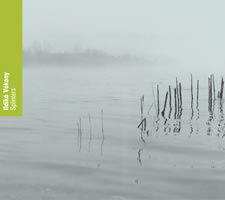 Of course many Hungarians have written for it, and this recital presents works by contemporary Hungarian composers. Kurtág is the composer most extensively represented on this disc, and his Splinters, four miniatures, lead the program. The first of the four pieces is an angular, cavorting line that, stopping and starting, reveals the cimbalom’s full potential. Hearing the instrument resonate is one of the pleasures of this recording, and the second piece, a slow Sostenuto, revels in a world of delicacy. The third piece, with its spidery runs and sharp staccato notes, is over before you know it, while the fourth, and longest piece, is a slow and somber Mesto that plumbs the instrument’s expressive qualities. The Eight duets for violin and cimbalom are also terse, but the sinewy violin provides great contrast to the cimbalom’s plunk. Some duets are dreamy, such as the fourth (Lento) and the seventh (Adagio), while others are spiky such as the 29-second sixth (Vivo), which suggests waves breaking against a rocky coast. The set is conceived as a whole and its structure gradually unfolds on subsequent hearings. The two other Kurtág pieces are some of his many short homages to friends, and are the wispiest works on the program. The work for Lutoslawski has appeared elsewhere in a version for piano, but is magical here. Kondor’s Hungarian folk song forms — Eight other duets for viola and cimbalom recalls Kurtág’s Eight duets. This set is similarly terse and concentrated, but the eight duets can be played in any order. One of the duets takes the famous short movement from Webern’s Op. 10 and arranges it for the two instruments. Jeney’s 12-movement Shavings is also hard to hear without taking in Kurtág’s influence, but the musical language and style of communication is extroverted and the contrasts dramatic. Vidovsky’s For one or two cimbaloms, with its complex rhythms and dynamic range, would make this work very difficult for just one player. Vékony plays against a tape of herself, reveling in the delicate tracery. The playback makes clever use of panning, so that the vanishing sound of the cimbalom disappears from one side when notes are struck on the other. Sáry’s Slow and Brisk is a two-part work suggesting older Hungarian forms and modes. It’s a rosy dance movement with chords that revolve around tonal patterns, and the concluding brisk part ends abruptly. Serei’s the is a graphic work where only pitches and tones are specified. The pitches are always in groups of five and the total musical material is consistent. The booklet characterizes this work as a piece of “minimal art,” but I have trouble reconciling Vékony’s intentionally arhythmic playing with that school of thought. I’ve surprised myself by the number of times over the past few weeks that I’ve played this disc. The cimbalom sound never ceases to amaze and fascinate me, and Vékony’s program and playing are rewarding and enriching.